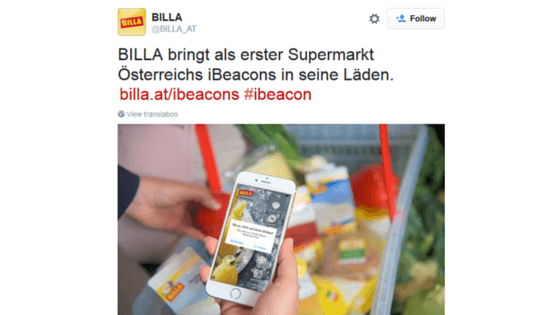 Austrian First: iBeacons power BILLA app to give their customers the best offers. Shopping just got more interesting. BILLA, part of the REWE group, has launched a pilot project using iBeacons in 11 stores, which will give their users the most up to the minute offers. This new exciting project is availble to use through the BILLA app, created by the diamond:dogs|group, which has integrated indoo.rs® award winning technology to add another layer to the customers experience. This is a very exciting project, as BILLA are the first supermarket in Austria to offer this innovative technology to their users. The pilot project has been rolled out in 11 shops in Vienna and Lower Austria, where 4 iBeacons per store have been placed at strategic point of sale locations, to enhance the shopping experience of the customers. The diamond:dogs|group and BILLA have worked together for a number of years to increase the shoppers experience though the BILLA app. The app already has a lot of features, such as the VORTEILS-CLUB card, shopping lists, recipes, etc. already available. The idea behind this pilot project is to offer BILLA shoppers another level of interaction with the BILLA stores and send special offers that the customers will appreciate even more. Implementing this innovative technology helps BILLA connect the online and offline shopping experience and helps their shoppers get the best value for money inside the store. Billa App: How does this all work? The iBeacon transmitters send out Low Energy Bluetooth signals which are then received by the phone and shown in the app to the customer, as long as they have agreed to receive them. As stated before this has many benefits for customers ensuring that they have the best offers and information available to them at all times. As the iBeacons can only transmit information, customer data is not collected and without the users consent, the information or download will not be able to be started. The Kontakt.io iBeacons installed have a maximum range of around 17 meters in ideal circumstances, allowing for a customer to be able to turn their BILLA app on, consent to receiving offers and information and put the phone bag in their bag or pocket.